Looking at the blue bars, it’s apparent that many furries tend to tell their friends about their furry identity—more so than they tell anyone else. This may be because many of a furry’s friends may, themselves, be members of the furry fandom. That said, only about 55% of furries said that many or most of their friends knew about their furry identity, with 45% reporting that some or only a few of their friends knew. Self-disclosure was even lower for family or day-to- day interactions: 40-45% of furries said that no one in their family, work, school or day-to-day life knew that they were a furry. Only about 35% of furries report being out to “some” or “most” of their family about their furry identity, and even fewer made it known at work or in day-to-day life. In another question, only 35.1% of furries reported any sort of outward display of their furry identity in day-to-day life (e.g., “wearing a collar,” “wearing a furry t-shirt,” “drawing furry art in public,” “wearing a tail,” “having furry badges on my backpack,” etc.). 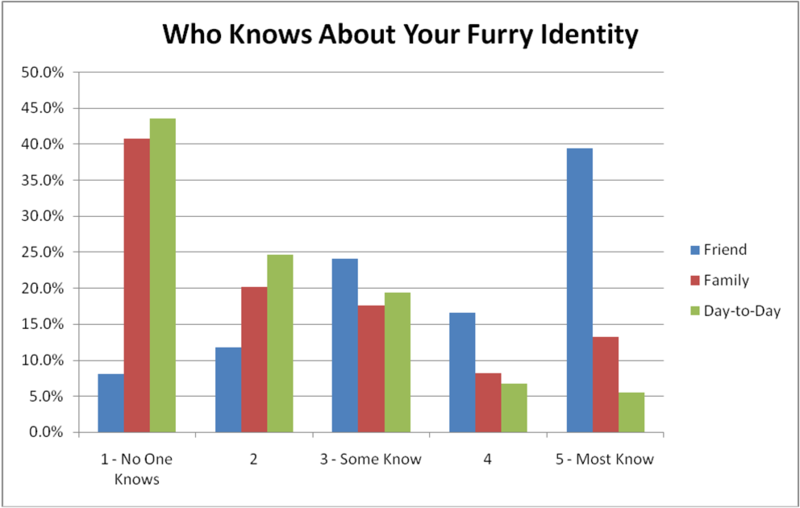 These data collectively suggest that, for many furries, their furry identity and affiliation with the furry community is something they hide from others. However, this increased self-disclosure is limited predominantly to being more open about their furry identity with their non-furry friends, not with their families, co-workers, new acquaintances, or strangers.